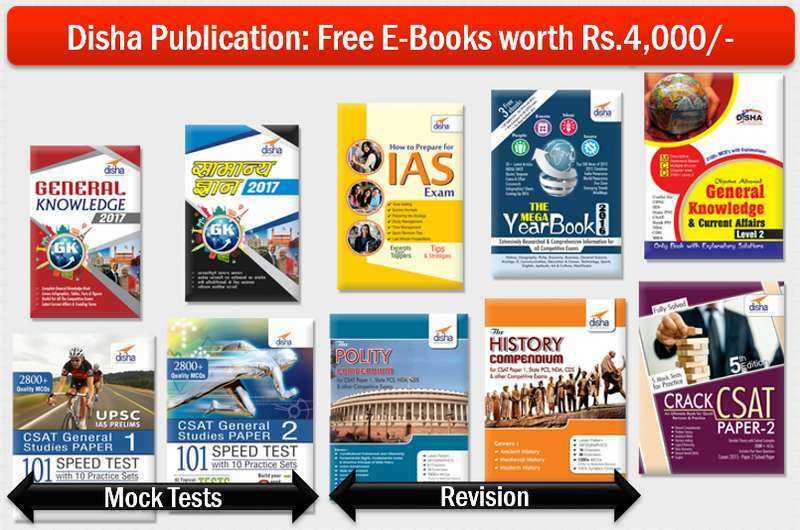 Disha publication is providing 10 free ebooks worth Rs. 4,000/- with promo-code “Mrunal“. It comprises of Mind Maps, Infographics, Charts and latest exam pattern MCQs with the objective of better retention from examination point of view. The book contains 82 Topical Tests + 9 sectional tests + 10 Practice Tests with various types of questions like Statement based, Matching based etc. The book contains 2800+ Quality MCQ’s in the form of 101 tests which further divides into 82 Topical Tests + 9 sectional tests + 10 Practice Tests. It has been written in a concise format with key concepts required for the exam. It covers 2011 solved papers with 5 Mock Tests. The MEGA Year Book 2016 is heralded as comprehensive compendiums of reference materials on GK subjects – Current Affairs, Panorama, Geography, History, Polity etc. The book contains 3100+ with explanations Statement based Questions asked in competitive exams. The book offer a variety of information on History, Geography, Polity, Economy, General Science, Ecology & Environment, Computers, Miscellaneous, Indian Panorama etc. The book has been written with the objective to provide short and crisp information on GK required to crack the various competitive exams with latest updates. The book is an attempt to guide, motivate , provide , strategies and tips to students who aspire to prepare for CSAT & IAS Mains entrance exams. Instructions: how to get free e-books? Hurry up! Promo-code valid till 16th June, 2016. Select the book which you want to buy, by clicking on the links given in this article. Click on Add to Cart. 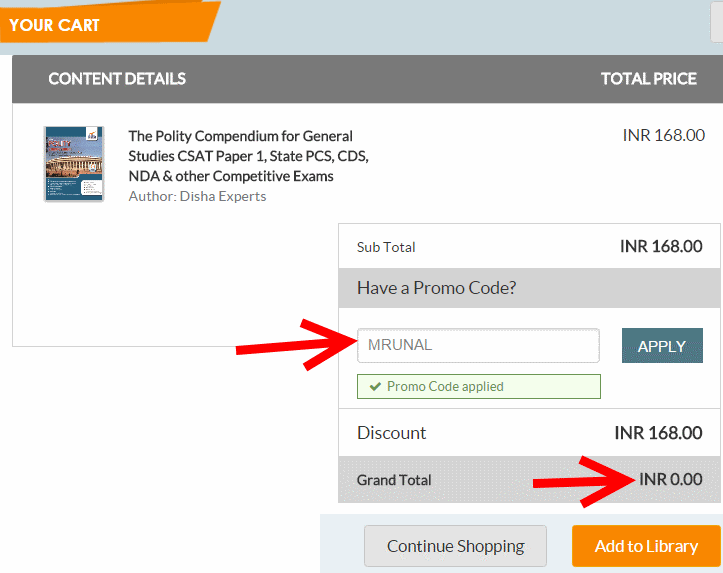 Apply promo code “MRUNAL” and click add to Library for Rs.0. Free-ebooks will expire in 15 days from your online library.But think of it as a borrowing from online library, with positive-pressure to finish them within 15 days! especially History, Polity- Revision compendium and mock tests. This offer and promo code is valid only on DISHA publication’s official store i.e. educoreonline. Q1: What happens after 15 days? will I be *AUTOMATICALLY* required to pay money? Ans. No, the book will disappear from your library. There will be NO automatic demand of money. However, if you like it, you may purchase its physical or e-copy subsequently. Q2: How do you count 15 days’ deadline? Ans. 15 days will be counted from date of purchase of a specific individual book. If you buy another book after a week, its 15-day trial will be counted separately. Q3: Are these e-books downloadable as PDF, epub, mobi and other format? Ans. No, but you can read them at our online library interface with inbuilt utility tools to highlight text, make notes, zoom-in/out and add bookmarks.